Use our online Quote and Layout Generator or request a quote by fax/email. This is an updated test version, with added capability for openings, stairs, structures and multiple decks. Generated estimates are subject to review by a sales executive. BEFORE YOU BEGIN: Measure and record outside dimensions of your deck. For the optimal graphics experience we recommend Firefox and Chrome. Microsoft Internet Explorer users are highly encouraged to upgrade to the latest version. Users of older IE versions will be prompted to install a small plugin. With IE you may need to click the "View in full window" button to view the layout. Most other browsers do not require the plugin. Moving clockwise enter deck measurements and directions. Note where the shaded area is, it represents the deck. Call us with any questions. Click on the icon to start. 1. Download this grid sheet to draw your project on. 2. Measure and record outside dimensions of your deck. 2. Sketch out your deck and fill in the form. 3. 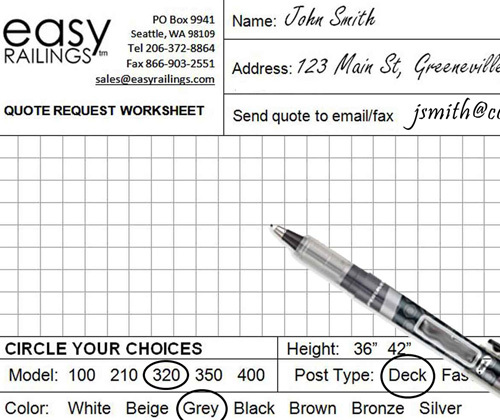 Fax your sketch to 866-903-2551 or upload it from the Contact page or email it to sales_at_easyrailings_dot_com. We will prepare your quote typically within 24-48 hours. In-stock items will be shipped within 3-5 business days, plus time in transit. Returns are accepted within 15 days of receipt, a 15% restocking fee applies. Shipping and handling costs are not refunded. If your purchase included a free shipping and handling offer, a flat 15% shipping cost reimbursement applies. Any missing or damaged parts must be reported within 3 days of receipt. Damaged or defective items will be replaced free of charge to you. All returned products must be in original condition and packaging. If you have any questions about assembly please contact us. There will be no refunds for items that have been assembled, cut, installed or otherwise modified.